Stick some style and sophistication on each envelope when you order this original return address label design featuring the a monogram of the letter 'I'. It's an ornate selection that can be ordered in any of the 26 letters in the alphabet - from Abrams to Zalinkski! You'll give all your outgoing mail a finishing touch with class. What you'll really love about these labels is that they are self-adhesive. Forget about scribbling out your return address all the time. Just stick a label on each envelope and move on! 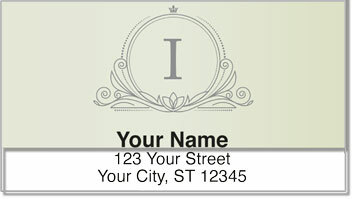 Get your very own I Monogram Address Labels from CheckAdvantage today! Complete your order with matching checks.